Autism Spectrum Disorder (ASD) is known to be a developmental and nuerological disorder, due to the main pathology affecting the central nervous system and because symptoms usually present themselves by the age of 2-3 years old. The origins of ASD are still unknown, but there is a lot of speculation about what causes its development. More severe forms of autism are diagnosed at younger ages when certain developmental milestones are not met, whereas some cases might not be evident until children are four years old. As recently as 2018, the CDC has found that 1 in 59 children are eventually diagnosed with some form of autism. Common symptoms associated with ASD are difficulty with human interactions, communication, and behavioral problems like repetitive or restricted behaviors. Social impairment is well documented in ASD cases. Commonly reported symptoms are little eye contact, difficulty holding a conversation, facial cues and expressions, and unusual tones of voice. Overall, these symptoms impair the ability for people with ASD to communicate properly with others and to properly respond. Behavioral symptoms include: getting upset easily over changes to a routine, high sensitivity to noises or light, and echolalia (compulsive repetition of words and phrases). A proportion of those with ASD have extraordinary abilities in math, science, or art. Memory abilities can also be augmented, allowing individuals to remember things for longer and in more detail, especially on the sensory level. 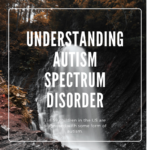 ASD is known as a spectrum disorder, because people show varying severity in their symptoms. A diagnosis of ASD includes Asperger’s, autism, childhood disintegrative disorder, or any unspecified developmental disorder. Asperger’s and high-functioning autism usually aren’t diagnosed until the individual is in adulthood and a diagnosis usually arises due to social difficulties. Childhood disintegrative disorder is when a child seems to be developing normally but show sudden social or mental deterioration. In the majority of cases, genetics seems to play a role in the development of ASD. Those who have siblings with ASD are more likely to be diagnosed. There are certain risk factors associated with an increased likelihood of ASD, like older maternal or paternal age. If you or someone you know is struggling with a mental health disorder, please feel free to contact the professional team at Lifeline Connections for help! Getting yourself help, whether it is through self-help or by reaching out to professionals is an important part of recognizing thatyou are struggling and is a good step forward to get the help that you need. You can visit Lifelineconnections.org or call 360.397.8246 for more information.